In Who’s Your City, urban economist Richard Florida notes a significant result of his Place and Happiness Survey; of five major categories that had a correlation with one’s satisfaction with his or her community, the strongest was aesthetics, ranking more important than physical and economic security, leadership, openness, and a close second, basic services. In other words, aesthetics matter. As the survey showed, aesthetic beauty leads to happier people, which in turn leads to more creative, innovative, and generally productive people. Thus, Pershing Square’s well-deserved reputation as a home to drug dealers (and their clients), bums, and homeless people can no longer continue if Los Angeles hopes to have its dreams of a revitalized downtown realized. The view that the square’s current design leaves much to be desired is widespread, and perhaps more noteworthy is the fact that this view is held not only by trained designers or architects but rather average, everyday Angelinos. This supports my belief that good planning or design is something that everybody knows when they see it, though it may be hard to pinpoint why. As a case study, I examined the details of Pershing Square’s design, how they affect the park’s success as a whole, and how they could be improved. The square as it currently stands was designed by the team of Ricardo Legorreta and opened in 1994. It was set up to reflect a number of notable characteristics of California. The café tables are shaded by orange trees, the park’s only water feature is a fountain that allows the water to drift out to ground level to imitate waves on the beach, and a large zig-zag carries from the middle of this fountain all the way out to the street to represent the fault lines that riddle the state. This is all well and good, but the organization of these features doesn’t help the park in terms of safety and usage. First and foremost, the designer simply tries to accomplish too much in terms of what they intended for people to do in the park. A small portion of the park is green while the majority is slated in concrete or granite materials, providing for a plaza-like atmosphere. This seems great at first glance—it provides room for both those who’d like to play on the grass as well as the business lunch or shopping crowds that just want somewhere to hang out and eat during the day. However, the square just isn’t big enough to satisfy the two. The grassy area of the square is divided multiple times by random paths of concrete, essentially prohibiting any kind of active recreation as well as forbidding large groups from gathering together on the grass. Perhaps even more problematic is the transition between the two areas. Slabs of concrete jut into the grass, leaving those who would be crazy enough to try to use the grass for recreation feeling unsafe and confused. Pershing Square is only the size of one city block, and this provides an example in which the designer should’ve picked one type of area to define the park and stuck to it. A next issue that must be addressed is seating. William H. Whyte, an urbanist who wrote quite a bit about the use of public space in cities, abhorred the overuse of benches as street or park furniture because they are too rigid and don’t provide people the opportunities to sit how and where they feel comfortable. This is clear in essentially any street or park bench around the country. When they are being used, there’s one person on one side of the bench and perhaps another on the complete opposite side. No one feels comfortable sitting in the middle, and since everybody is facing the same way they prove to be horrible venues for social interaction. However, Pershing Square’s architects seemed to have read Whyte’s analysis and thrown it out the window, providing along the southern periphery of the fountain one huge, immovable concrete bench with iron armrests every few feet. Not surprisingly, the bench is usually used by the homeless and very rarely anyone else for a substantial period of time. Seating could also be improved when it comes to the fountain and the stairs in the plaza area. Fountains and stairs have both proven to be incredibly successful in urban parks across the country. Fountains tend to be a meeting point or social node within the space, and this designation of the fountain as a meeting space is only aided by people having the ability to sit on the ledge of the fountain as they relax and to read, eat, or speak to each other—the fountain of Bryant Park in New York City serves as a great example of this. However, as mentioned above, the fountain collects water at ground level and provides only a small ledge on which people can sit and gather. Outdoor stairs have also proven to serve as a great meeting place because they allow people the opportunity to sit and converse with others while providing footrests on the stairs below and backrests on the stairs above. Perhaps a more important aspect of the steps is that they provide a bit of a theater-like experience in which you can always see above the head of the people beneath you onto the ground below. What could be better for watching what Jane Jacobs dubbed the “sidewalk ballet” of urban life than a theater seat? 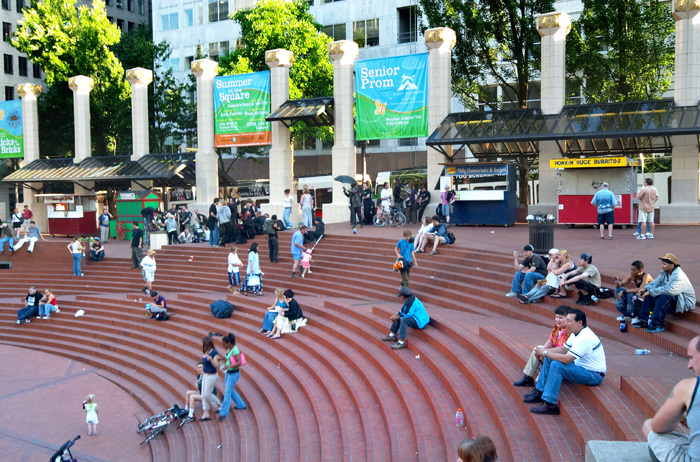 A good example of stairs being used for seating and social interaction is the series of steps in Portland’s Pioneer Courthouse Square. Unfortunately for Pershing Square, the steps are far too shallow to provide a legitimate backrest and push the legs up too far, as if riding a miniature bicycle. Moreover, where there are steps, there just aren’t enough of them to provide any kind of theater-like experience, even if there was anything worth watching going on below. However, a more critical issue than all these put together is the fact that the plaza is built atop a large parking garage, thus causing it to be raised several feet above the level of the adjacent sidewalks. Here’s to hoping that Pershing Square is the final example of urban public spaces not being at the level of the streets around them. Pushing the plaza so far above the eye level of one walking along an adjacent street essentially cuts it off from the outside. When pedestrians can’t see what’s going on inside a park, not only are they unable to see its appeal but they are naturally repelled from it due to an inherent fear of the unknown. This would be problematic enough by itself, but of course the designers chose to emphasize this issue by surrounding the park with large trees, sculptures and structures that ensure that nobody at street level could have a clear view of what was going on inside the park. The history of Bryant Park proves this point fantastically; until 1988, it was also raised several feet above street level and was known as a seedy place full of drug dealers and prostitutes. But lo and behold, after a revitalization effort aided by none other than William H. Whyte himself, the park was lowered to near-street level and has been vibrant and successful ever since. As for providing parking, Angelinos are aware that LA is an auto-centric city, but providing more room for parking won’t alleviate the problem—if anything, it’s negative reinforcement. Keeping the number of parking spaces in downtown LA stagnant can only help the area as it tries to become more pedestrian-friendly, as well as gain ridership for the metro system. It’s unlikely that the designers were aware of LA’s aggressive metro expansion some 20 years later and so it may not be fair to blame them for providing extra parking, but the issue remains nonetheless. 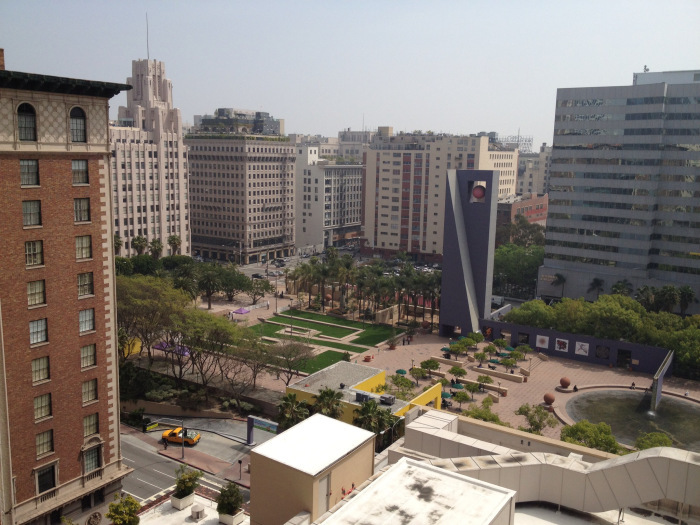 Pershing Square doesn’t need a touch-up, but rather a full makeover. It would benefit greatly from lowering the grade to street level, perhaps at the expense of parking underneath, and removing the trees and structures that block the view of pedestrians outside the park. The fountain should be remodeled to be perhaps a bit more traditional, offering ledge seating for people to gather during the day. As for additional seating, the huge concrete bench should be completely removed (it also blocks views across the space), replaced instead by movable chairs so visitors can have more control over where they want to sit and in what orientation. Steps should be totally eliminated—although they can often be beneficial in public spaces, Pershing Square is relatively flat, and implementing a set of stairs large enough to benefit the park would serve as a nuisance and eyesore, as well as limit visibility. Improving these elements as well as increasing lighting so people can feel safe in the park around the clock would ensure not only that the plaza itself is well-used, but would more than likely aid downtown economic development and make it once again a hub of commerce and activity.